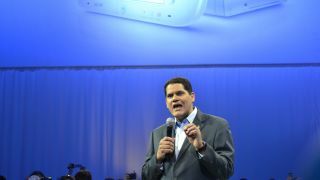 Nintendo continued its anti-establishment E3 2013 with these words uttered by Reggie Fils-Aime, president of Nintendo America, at a Software Showcase for the Wii U this morning. With no new hardware to show, the company is placing emphasis on why the handheld, and to a lesser extent the 3DS, are still worth a gold coin. "Outside, the world waits for the word that only you can deliver," Fils-Aime told the crowd inside its not-yet open booth. "What type of magic box is going to play my game? Can I get it through hard copy or download? When can I get it? These questions are secondary," Fils-Aime continued, clearly distancing the company from counterparts Microsoft and Sony, who opened the annual gaming conference with details like these for the Xbox One and PS4. "What matters is how you feel when you play a game." What followed was a tap dance of top Nintendo developers explaining six new Wii U titles from Shigeru Miyamoto; and Eiji Aonuma introduced Pikim 3 and the Legend of Zelda: The Wind Waker HD. The company had earlier laid out these and third-party offerings like Batman: Arkham Origins and Assassin's Creed 4: Black Flag in a Nintendo Direct. Through a translator, Miyamoto, whom a digitized Mario called "the man who brought me to life," made the Wii U a hallmark of his talk. "When I started working with the Wii U, I thought that this is the right hardware for Pikmin 3," Miyamoto said. "This was about two years ago. I truly believe this is a game that can only be played on a Wii U." The U has struggled from a dearth of games, but Nintendo is trying to shift that perception with the introduction of new titles here at E3. The Showcase had a touch of whimsy and innocence, themes different from the shoot 'em up and speed away order of Microsoft and Sony's shows. There were devs in cat gloves and ears, a giant Donkey Kong and hands on time for attendees. The company also introduced a new character to Super Smash Bros. for Wii U, the Wii Fit trainer, who took on Bowser before Nintendo staged a duke it out battle with the another new character, Mega Man. Nintendo's time here is so far cute, kitschy and silly, but also pointedly serious about showing why the Wii U shouldn't be ignored. We're not completely taken, but we hand it to Nintendo for doing something different. We've got pricing details for the Xbox One and PS4. You know you're curious.